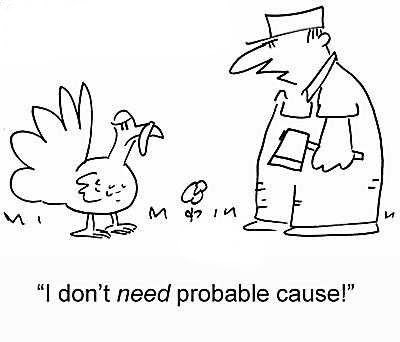 It seems that the "poor turkey that had the stuffing beaten out of him" never made it to the hospital. Happy Thanksgiving from everyone at HPD! The Recruiting office is closed today and tomorrow for the Thanksgiving holidays, but we are never really closed. You can apply online anytime by going to http://www.hpdcareer.com/ . Or just by clicking on the link to the right of this post. While your at it, show your visiting family members all the cool stuff you can do once employed as a police officer with Houston. Wouldn't that be neat if you and your cousin, brother or sister went through an academy class together? Happy Thanksgiving everyone! Reports are starting to come in regarding an incident that recently occurred. 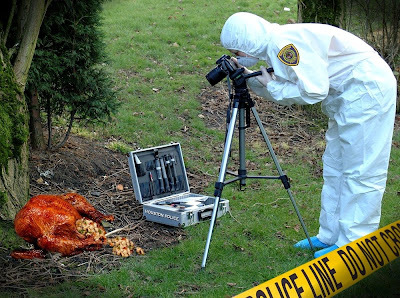 According to sources, a turkey was found near a tree on the southeast side of town. HPD Investigators and the Crime Scene Unit are on the scene and details are forthcoming. 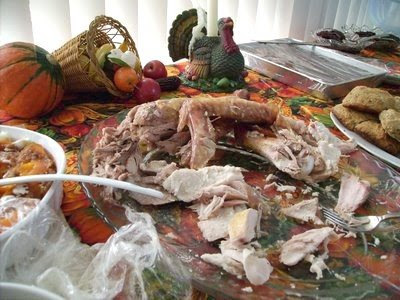 It seems that this poor turkey had the "stuffing" beaten out of him. Executive Assistant Chief Martha Montalvo was originally born in Ecuador, South America. She immigrated with her family to Houston, Texas in 1963. She was raised on the east side of town, in the Canal/Navigation area. At the age of 18 she made the decision to become a citizen of the United States, as this was her home and country of choice. She entered the Police Academy in January of 1980 and will have 29 years with HPD in May of 2009. Her current title is Executive Assistant Chief and she is responsible for Administrative Operations. This Command includes Internal Affairs, Office of Inspector General, Inspections, Human Resources, Training Academy, Psychological Services and the Crime Analysis/Command Center. She holds a Bachelor of Science and Master of Science Degree in Criminal Justice Management, and also has a Master Certification with Texas Commission of Law Enforcement and Officer Standards and Education. I recently had a chance to ask her a few questions. Why did you become a Houston Police Officer? 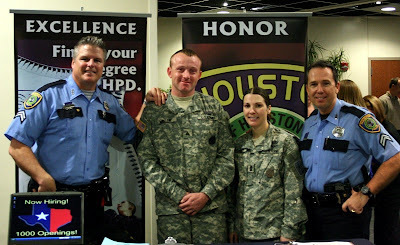 I became a Houston Police Officer because I desired a career, not just a job. 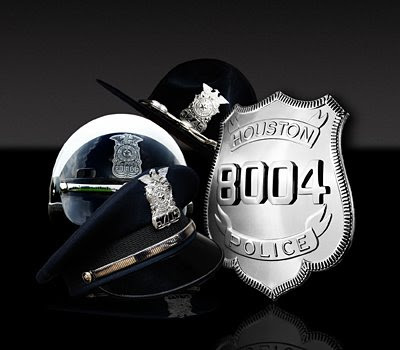 I wanted to make a difference with my life and decided that the Houston Police Department afforded me that opportunity. I am a firm believer in the benefits of education and recognized that this was the path I needed to take for self benefit and promotional opportunities. I keep up my knowledge base through professional affiliations, the reading of professional literature, and eventually hope to return to school for a Doctorates Degree. What career paths have you taken since you became a police officer? As I climbed the career ladder I have worked and been exposed to various fields. 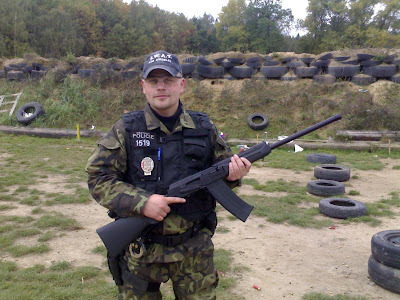 Like all officers I began in the field as a patrol officer. First responders have the authority and the responsibility to provide service to our community, and are the first contacts the public has with law enforcement. This period was the foundation for my career and is the core for all police officers. As my career progressed, I worked in Communications, the Academy, Homicide, as a Tactical Commander, Field Training, Crime Analysis/Planning & Research, to name a few. 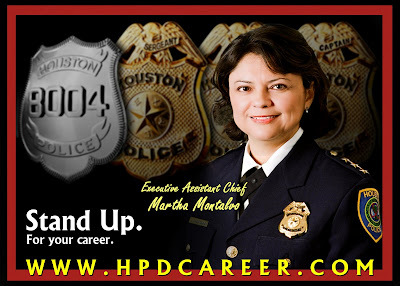 A major benefit in a career with the Houston Police Department is the wealth of career paths an officer can choose. One can specialize or be a generalist in various units and divisions. I successfully promoted up the various ranks, Sergeant, Lieutenant, and Captain, through a competitive process with my peers. Each rank held new challenges and learning opportunities. In 1988, I was appointed to the rank of Assistant Chief by then Chief of Police C.O. Bradford. In 2004 I was appointed to the rank of Executive Assistant Chief of Police by the current Chief of Police, Harold L. Hurtt. Was your family supportive of you wanting to become a police officer? I am supported by a very strong family. Without their assistance, especially from my spouse, a police lieutenant, and our two children, I could not have taken on the additional responsibilities that are inherited with higher positions. As a result of prayer, hard work, tenacity, and family support, my journey with the Houston Police Department has been fulfilling, purposeful, and exciting. 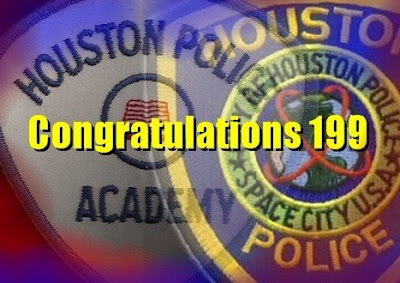 Academy Class 199 graduates tonight from the police academy. Has it been six months already? It seems like yesterday you were going through orientation. Congratulations to you all. I know you will make us proud. We have many more classes to fill. 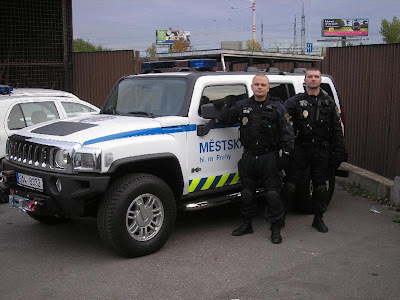 Come and join these men and women in BLUE (no more white 199!) and join our family. Just like Thanksgiving, we always have room for you at the table with classes starting every six to seven weeks! Just so you know, this sort of police chase is highly unlikely in Houston. Today's weather in Houston as reported by www.weather.com is 73 degrees and sunny. Which hat fits you? From riding a horse to flying a helicopter, you can do it here. We are still in Detroit. You still have time to come by and start the application process. Email me at officermccoy@gmail.com and we will fit you in. I am in Detroit, Michigan this week along with my partner. We are here interviewing potential police applicant's for HPD. If you would like to come by this week and talk with us, please email me at officermccoy@gmail.com and we will fit you in. 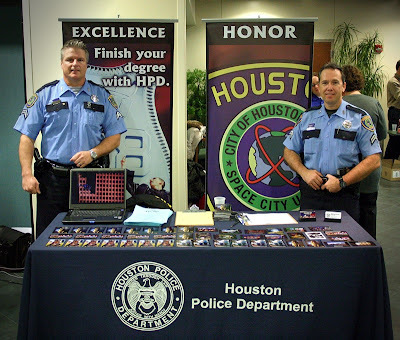 As we were discussing the possibilities of a great career with HPD it occurred to me, that readers of this blog may not know the reality of how easy it is to become a Houston Police Officer. Don't get me wrong, you still have to meet the criteria but I was thinking more along the lines of the application process. 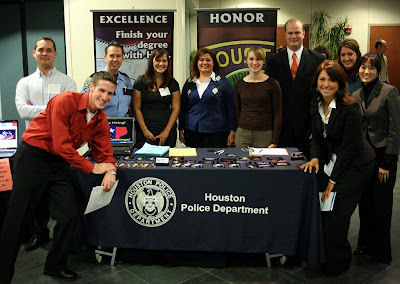 I was listening to the experiences of the applicant's during our orientation tonight and I realized, if you really want to be a police officer, HPD is the place to go. Let me tell you how simple this process really is. 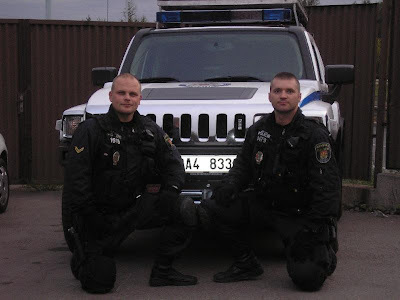 You apply online at http://www.hpdcareer.com/. A recruiter calls you within a week for an interview. No ranking of the test (because there is no test upfront). No waiting on your rank and hoping that we get to your number to get an interview. We pay YOU to go through our academy! I bring this up because you should hear what applicant's across the United States are going through to become a police officer. They must take a test whenever the test occurs...it could be months down the road. Once they take the test, they have to wait for their ranking. Depending on their ranking they have to wait for a call, if they rank high enough and are lucky enough to get a call, the department may only have a few openings and they will be out of luck. Most departments up here require you to pay for your academy without the guarantee of a job, we don't. We will pay you 43,965 for your first year of training and probationary period. Listen folks, the truth is we are going to be hiring 1000 new faces over the next few years. 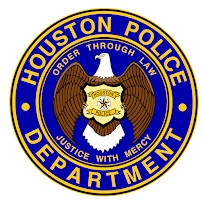 I mean this when I say this, there has never been a better time to join HPD than right now! 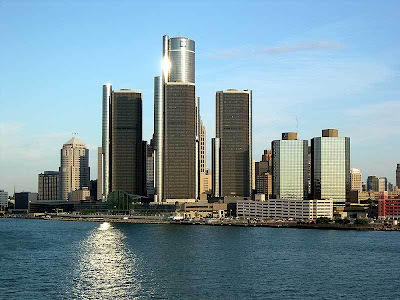 We will be in Detroit November 17th through November 20th to conduct interviews. We will be at the Holiday Inn Express at 46194 N I-94 Service Drive, Belleville, MI 48111. This Holiday Inn Express is located near the Detroit Airport. You must apply first at www.hpdcareer.com . Once you have applied online we will contact you to set up an interview with you during our stay. You must apply as soon as possible to make sure you get an interview. If you are not sure you are ready to take the next step and would like to just talk about it, we would be happy to meet with you and tell you about HPD. Please email me if you have further questions. My email address is officermccoy@gmail.com . I am looking forward to meeting each and everyone one of you. See you in Motor City! We are in the Kirby Student Center at the University of Minnesota Duluth right now. 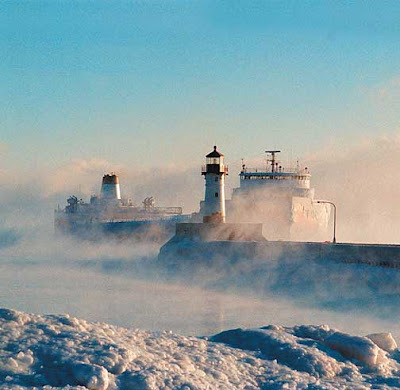 If you are reading this blog and you are in the Duluth area, STOP READING and come see us. We have openings right now. If you can't make it, apply online at http://www.hpdcareer.com/. 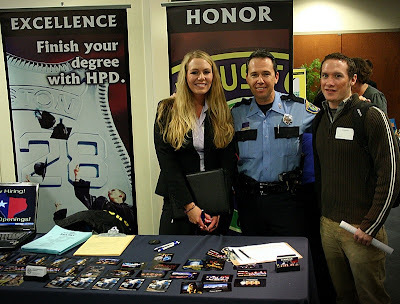 HPD will be at the Head of the Lakes Job Fair at the University of Minnesota in Duluth, Minnesota from 10:00 am to 2:00 pm on November 13, 2008. Come by and speak with us about a career that does not require a jacket this time of year. 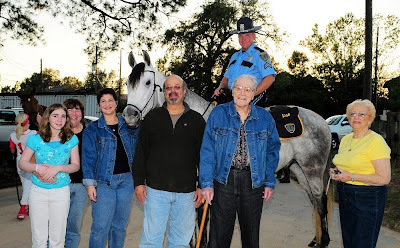 Ms. Brenda Sherman, along with family and friends, donated $2,500.00 to the Houston Police Foundation for the purchase of a horse in honor of Mr. Ginsberg. Mr. Sam Ginsberg celebrated his 97th birthday on October 30, 2008. He is a wonderful husband, father and sibling. He had open heart surgery at 92. Mr. Ginsberg was a travelling salesman for all his working life and also drove an 18 wheeler before becoming a salesman. Family and Friends have donated for the horse to be given to the Houston Police Mounted Patrol Division in his honor. 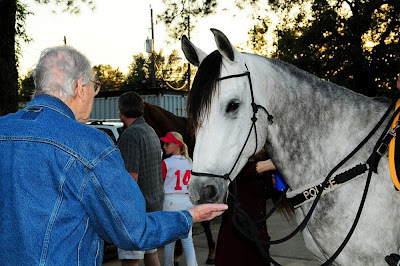 The horse was named "Sam" after the honoree. Welcome to the HPD "Sam" you look like a fine young (cadet)horse. Thank you for your support. 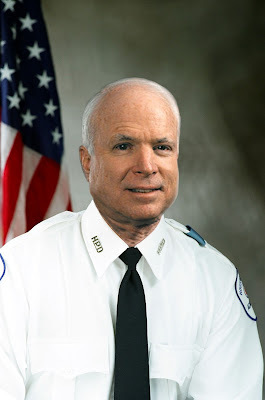 Senator McCain lost his bid for the presidency last night and will return back to his duties as a Senator of Arizona. He still has two years left in the Senate. 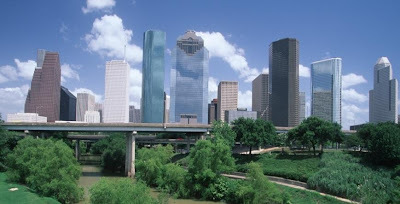 If you are looking for another job after your term, please look us up and we will make you one of Houston's finest. 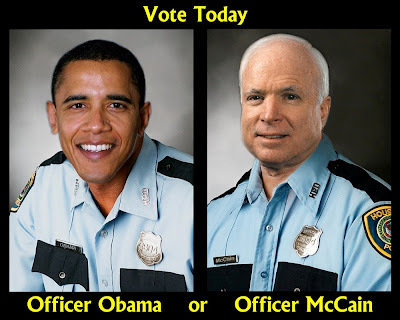 As for Barack, we would still love to have you become a police officer with us if your not sure you want your new job. Let us know, I can get you an interview within the week. Barack talks about "change". Each of you reading this can also make a "change" in your community by making a difference and keeping your neighbors safe. Apply today and we will call you within one week (or sooner) for an interview. There has never been a better time to join than right now.
" Just so you know, whichever one of you loses today, I am sure we can find a spot for you in the next academy class. 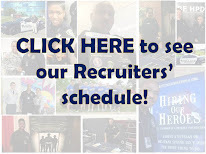 Just apply at http://www.hpdcareer.com/ and start your application process. We can interview you as early as this week. Everyone is a winner today."